DocVikingo, with whom I had the pleasure of meeting and diving in late 2004, and again in 2005, is a well-known and respected internet diving personality and journalist. DocVikingo is a contributor to the world of dive travel and dive medicine, and his work regularly appears in Undercurrent and occasionally in DAN's Alert Diver magazine. 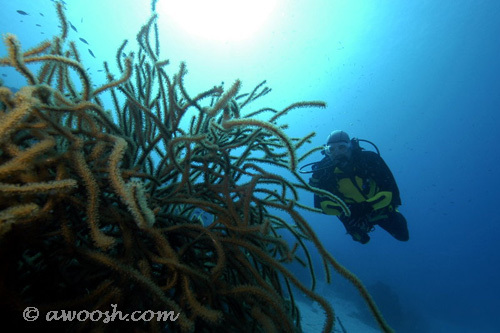 Doc is a moderator of Scuba Clinic, an online forum for scuba medical issues. In the past, he had a regular column in Rodale's Scuba Diving magazine. He is also a longtime contributor to Rodale's Diver to Diver Forum. In keeping with the non-commercial and ultimately information sharing raison-d'etre of this website, Doc V has graciously agreed to allow Awoosh.com to host a Doc Vikingo Resource Page for Divers, featuring several of his most sought after articles and lists. Many thanks to Doc V for his continuing commitment to sharing important information with a world of divers. Recently added or updated articles in this resource are marked with *. Any queries or feedback regarding the content of the articles in this index should be directed to Doc Vikingo. Even in the rain it’s a blue sky experience. Not bad for an all-inclusive romantic getaway. Don't leave home without it. Contrasts & comparisons of the options for Dive Accident Insurance policies. Everything you need to know about insuring your underwater photographic equipment. Is it worth it? Doc Vikingo analyzes the costs and lists available underwriters. Beware - your dive insurance policy may not cover you for pricey medical care while traveling. "Can I Dive With Diabetes?" "Can I Dive With Asthma?" "Can I Dive With Epilepsy?" "Should Physical Examinations for Divers be Regularly Required?" Everything you wanted to know, but were too embarassed to ask, including whether or not menstruating women are more prone to shark attack. How to avoid it and how to treat it. Doc Vikingo's comprehensive review of the issues surrounding Clinical Depression, medications and diving. Exercise and Diving: When Is It a Good Thing? Maybe you should think twice about that post-dive workout. Are children really suited to scuba diving? Read this and find out the current thinking on this controversial subject. Stategies for avoiding sand fleas (aka no see ums), mosquitoes and other bothersome and disease carrying insects. Seasickness can really ruin a day of diving. Here are some strategies for dealing with it. Pros and cons of these two remedies for motion sickness. Which is more effective? Causes of and cures for this nasty rash. How much, when and whom to tip on a dive boat. Ever wondered who to call if you get bent in Cozumel? Who to contact if you are in trouble with the law, or need a dentist? It's all here in Doc Vikingo's excellent Cozumel Survival Guide. Print it and bundle it with your travel documents. A great list of things to do for non-divers, après-diving or, Divegods forbid, when a Norte blows up and diving is cancelled. Another must-print and pack for your next Coz adventure. Is there good reason to worry about sharks while diving? Doc V reports on the risks and the techniques for dealing with shark threats. Sh*t happens. And when it does, it helps to have read this most informative article on how to handle scary things like upwellings and downwellings. How to ensure you are not the next victim. Advice on how to successfully sink the stink.